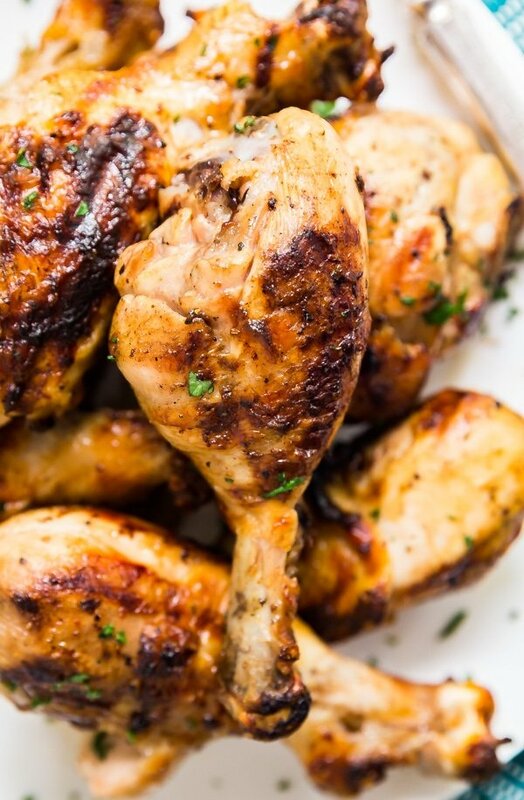 Grilled Lemon Pepper Chicken Drumsticks are exactly what your summer grilling dreams are made of. 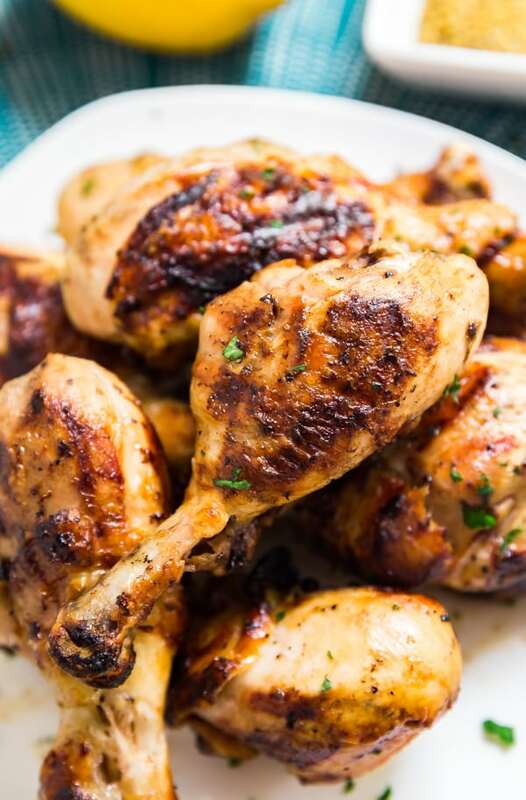 They’re so easy to make and have deliciously crispy and flavorful skin on the outside and perfectly tender meat on the inside! 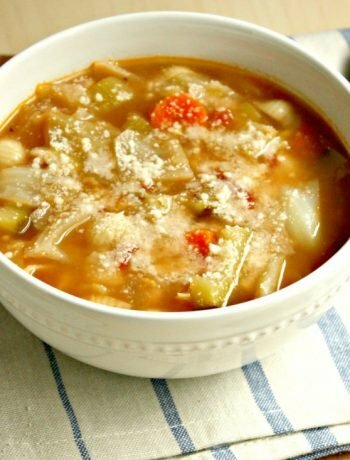 This recipe happened by accident and I’m am so happy that it did because it’s now get a permanent spot in our summer dinner rotation. One night I had a little situation I like to call Failure To Plan, which sometimes happens around here. I had some random chicken drumsticks hanging out in my fridge and no chicken drumsticks recipes were coming to mind. There was also the need to get dinner on the table, and fast! So I worked with what I had and made what I decided would be a quick lemon pepper chicken marinade. While it was cooking I was a tad nervous because although I enjoy lemon pepper, if you get overzealous (which I’ve been known to do from time-to-time). If you have too heavy of a hand, it can be pretty overwhelming. But I crossed my fingers and kept working on the sides while J took over the grilled chicken drumsticks. Boy and I glad I threw that dinner together! The minute I tasted it, I knew that lemon pepper chicken recipe was a keeper. The chicken was totally moist and tender but with that perfectly crispy skin that I live for. And the lemon pepper flavor was just right- not too much but just the right balance! To get as much juice out of each lemon as possible, roll it before cutting into it. While you can totally get the chicken into the marinade well in advance, if you’re pressed for time, don’t worry. I’ve also put the chicken in the marinade as little as 15-20 minutes before grilling and it still tastes great. Pull the chicken out of the fridge a food 15-20 minute before grilling to bring it a bit closer to room temp. You don’t want to leave it out long enough to put it in the temperature danger zone, just to take off the chill. 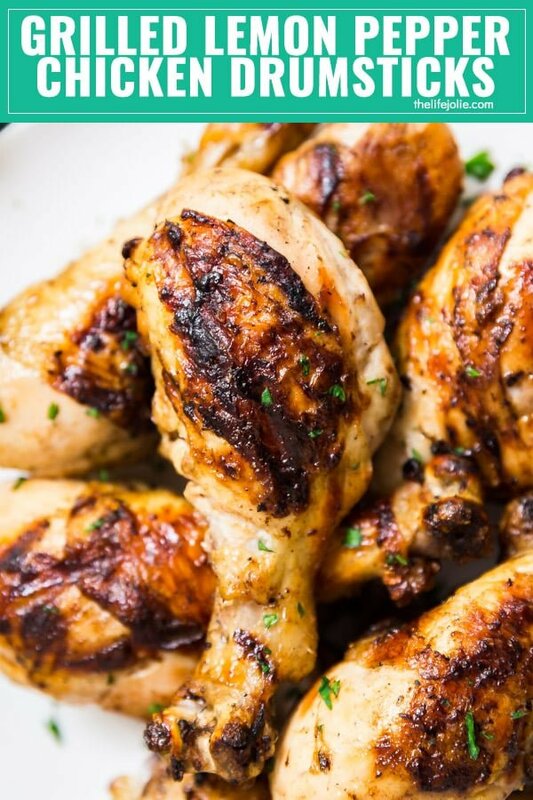 Don’t be afraid to get a nice char on the drumsticks. 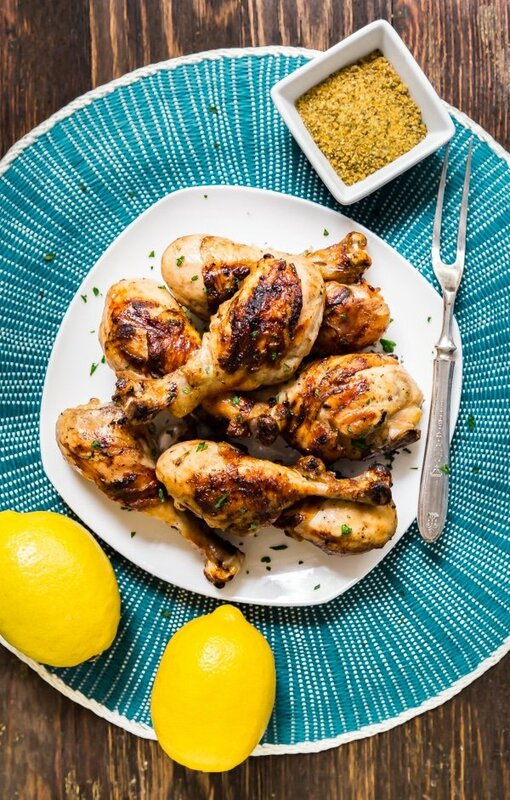 Grilled lemon pepper drumsticks benefit from having perfectly crispy skin while still maintaining their nice tender meat inside. Like any other meat, let it rest for 5-10 minutes before digging in to redistribute all those delicious juices. 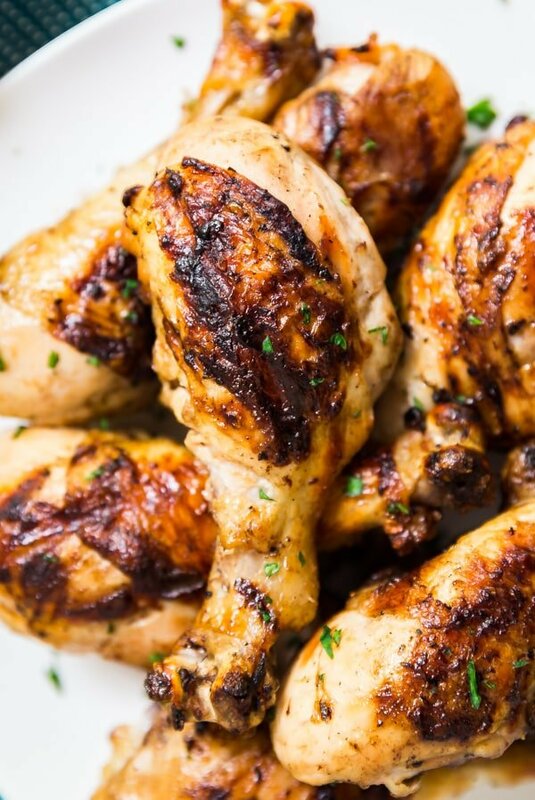 Grilled Lemon Pepper Chicken Drumsticks are exactly what your summer grilling dreams are made of. 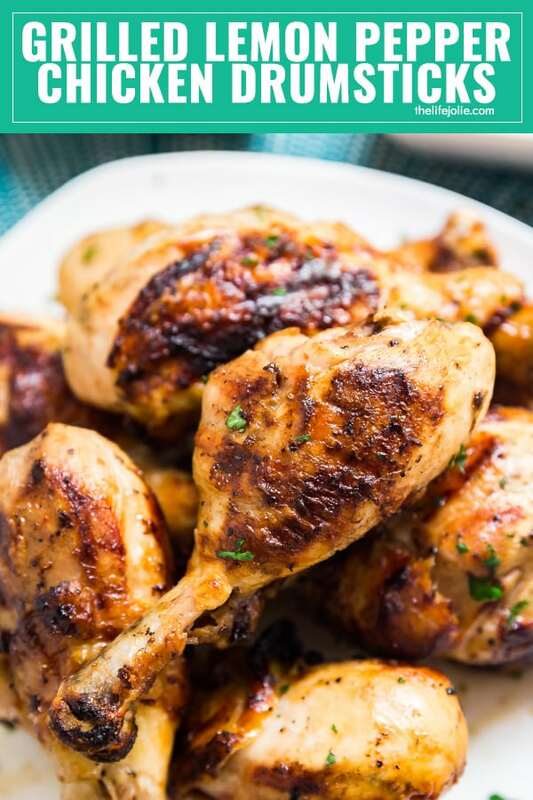 They're so easy to make and have deliciously crispy and flavorful skin on the outside and perfectly tender meat on the inside! Squeeze the juice from the lemons into a bowl (you should end up with around 1/2 cup). Add oil, lemon pepper, garlic powder and salt and whisk until well combined. Pour into a plastic bag and add chicken. Seal the bag and shake well until the drumsticks are well coated with the marinade. 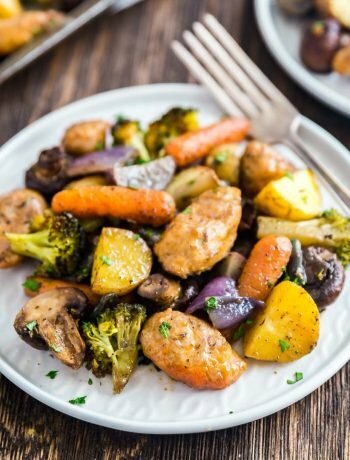 Refrigerate the chicken until you're ready to cook and remove it from the refrigerator 15-20 minutes prior to cooking. Spray the grill with cooking spray and preheat it to medium-high heat. Cook the drumsticks for around 15 minutes, turning them often. The cooking time will vary based on your grill and the size of the drum sticks. You'll want to have a really nice char on every side. Rest the chicken for 10 minutes and serve immediately after.